In the film we see the crowd filing into the venue. Before the band took the stage, there was a screening of Un Chien Andalou, a silent surrealist short film by Dali from 1929. 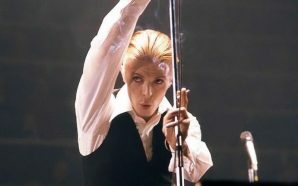 The opening track of all the the shows on the tour was ‘Station To Station’. “I first came across the footage that Phillipe Bergeron shot himself 40 years ago, via the 60 seconds that he had posted, on January the 11th this year, the day after Bowie died. Around that time I had been scouring the web, for material to flesh out my TVC-15 video. There is virtually no decent footage available from the ’76 tour. According to legend, a French TV station shot five songs at the final Paris show. A few minutes of that footage was shown on French TV, and featured fragments of three songs. And those fragments make up most of my TVC-15 video. According to the same legend, unfortunately, the reels of the five songs were misplaced when the TV station moved their archive, and they remain lost. Philippe’s one minute of footage was only Super 8, but it was very well shot, and unlike anything I’d seen before. So I immediately contacted him, basically asking, “Is there more than 60 seconds, and can I have it please?” Eventually, we talked on the phone a bit, and Philippe agreed to let me have his footage for my use. What came exceeded all expectations. It was beautiful material – close ups, long shots, pans and zooms and, unusually, plenty of band shots, from at least 5 totally different locations in the venue. The footage astonished me, I could hardly believe what I was seeing. However, it was silent, and moreover, there was no complete song, or even lengthy take. Just very short scenes, mostly less than 10 seconds, sometimes only 2 or 3 seconds, filmed throughout the entire show. The detective work began to ascertain what songs were being performed to decide out what the best use of the footage would be. Breaking the reel down into its separate components meant I then had well over 50 mini scenes. Anyway, to cut a very long story short, among the other songs I did eventually identify, there was – crucially – several verifiable fragments of Station To Station. Although these Station To Station fragments only totaled less than a minute, an idea began to predominate: to re-purpose the entire footage, use every scene, avoid dipping into any other source, and synch it to the Nassau live version, and try to create the video that we have here. I managed to use almost every second of Philippe’s footage. Where I have used a verified Station To Station scene, in its correct place, I have left it naked. In other places, the long cross fades, the superimposing, and other effects are devices to distract us from noticing that Bowie is not in fact singing the correct line, or indeed even the correct song. So, with that in mind, it would perhaps be best if you don’t pay too close attention to Bowie’s lips and the players hands! I don’t know how many millions of digital manipulations I’ve made to produce this thing, but certainly more could be done to improve it. There are some compromises in this video that I am not content with, but after in excess of 200 hours of obsessive and often frustrating work, including stretches of profound desperation when there were many minutes of blank void to fill, and no material or imagination to fill them, I’ve decided that this will have to do.